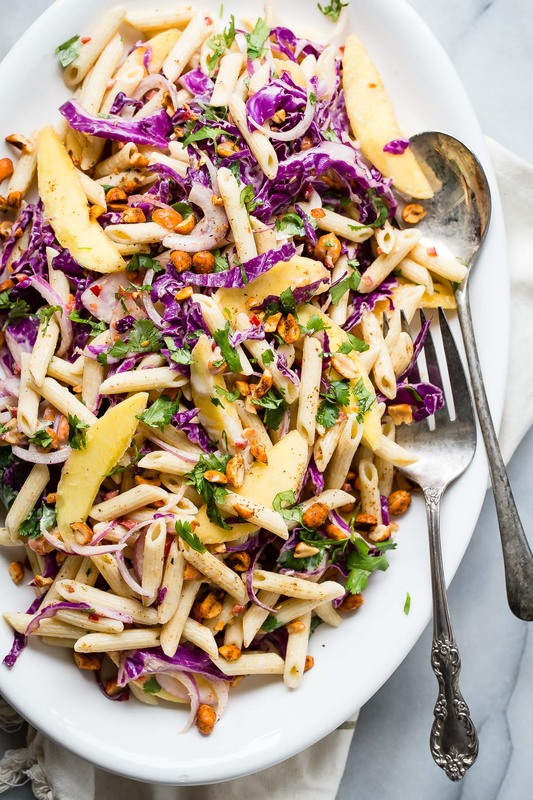 A fantastic summer pasta salad packed full of red cabbage, mango and spicy chili nuts. 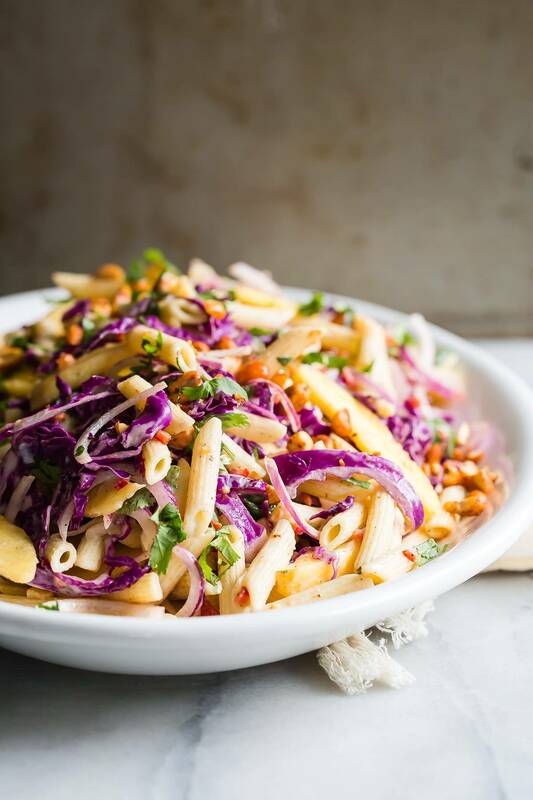 Serve this pasta slaw beside any barbecue dish. With summer in full swing, who needs a pasta salad to take to a barbecue or summer party? I picture many hands in the air waving like crazy. Well I just happen to have one for you and it’s a total keeper! 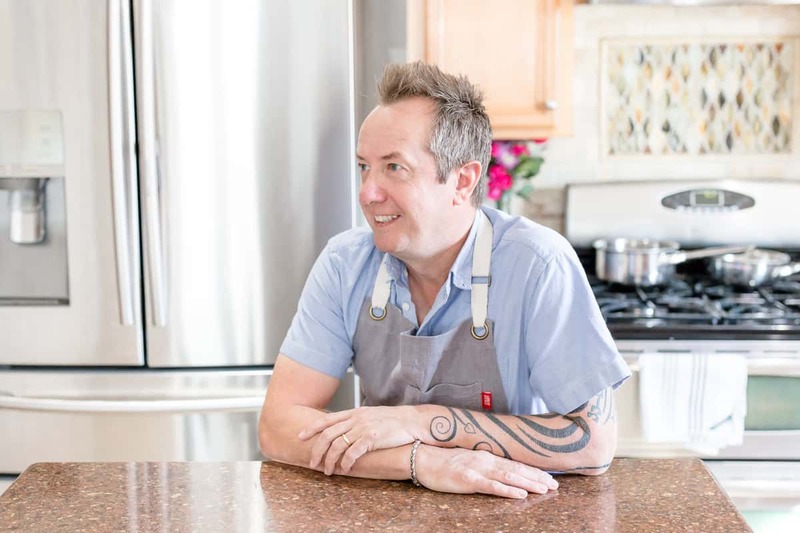 Dreamfields Pasta continues its run of Pastapalooza and from May through July you can visit them for loads of awesome pasta recipes and prizes. Each week Dreamfields Pasta will be hosting a themed Pastapalooza party and this week it’s “Papa-Palooza”. There’s a different theme every week until July 5th so be sure to check them out for some great recipes and coupons! Once you see your dad start to create something tasty for Father’s Day, grab a pic and upload it to this contest page. Your click might win you a pasta pack including new grill tools and a hammock! I’ve always wanted to take a hammock nap, between two trees with a cocktail in my hand. How To Enter- Visit the Pastapalooza contest page and submit your photo. You can enter everyday. Each entry also qualifies you for the Grand Prize drawing for a $1000 Visa Gift Card and a years supply of Dreamfields pasta! Usually when I make my pasta salads I’ll add a protein like salmon or grilled chicken making it almost like a main course. This time it’s all about the side dish, so I combined fresh ripe mango with red chili, red cabbage and spicy peanuts. The whole thing is tossed in a cool and creamy citrus yogurt style dressing. So if you were having second thoughts about this being too spicy, think again. 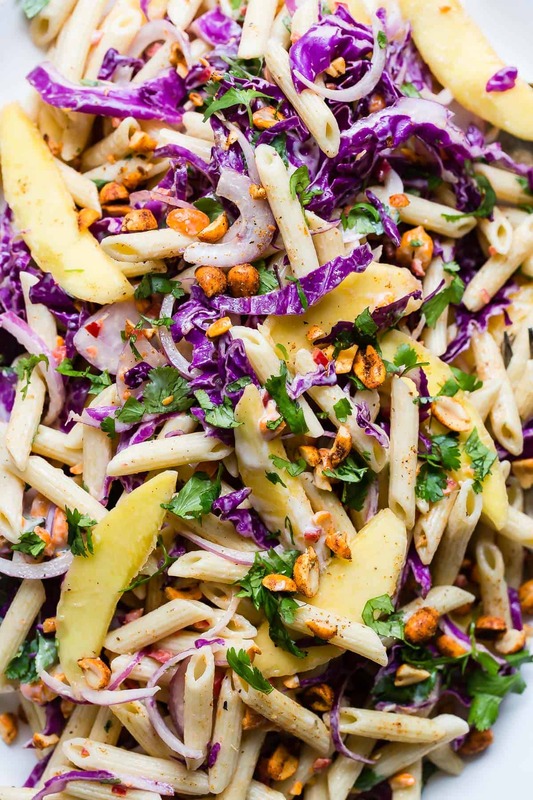 This is a pasta slaw salad that would be perfect beside any grilled meat or seafood. The yogurt dressing balances out the heat from the chilis, I also tested it out on my wife who is definitely not a spicy food fanatic and she loved it! 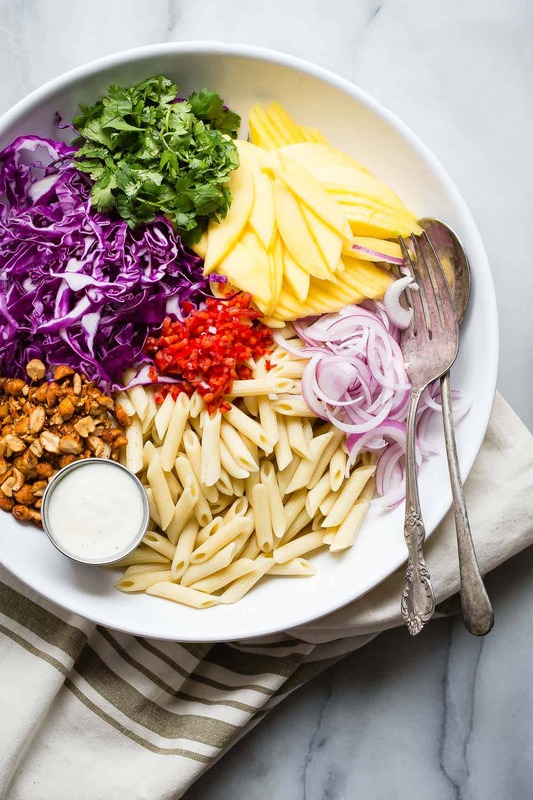 Dreamfields Pasta tastes just like regular pasta but contains inulin, a fiber sourced from chicory root to help with digestion, and it comes in all of the traditional pasta shapes! Sounds like the perfect way to see out Papa-Palooza if you ask me. This post is sponsored by Dreamfields Pasta. All thoughts and opinions are always my own! Gerry, I love this! Perfect for a fledgling vegetarian like myself! 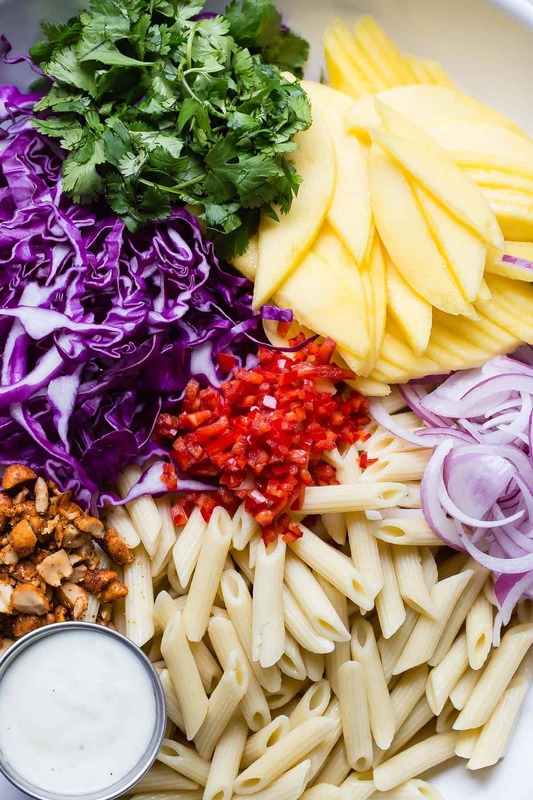 i”m loving these flavors and that mango dressing sounds fab! I am going to make this. Exactly what I was looking for! Thank you!